Response: Worldwide, triple negative and HER2 positive breast cancers, combined, account for about 370,000 women diagnosed annually. With recent advances in neoadjuvant systemic therapy (NST, chemotherapy and targeted therapy given before surgery) for both subsets, the pCR (pathologic complete response- when no residual cancer is found) rates found at the time of surgery in these populations can be as high as 60 percent. This high rate of pCR naturally raises the question of whether surgery is required for all patients, particularly those who will receive adjuvant radiation. We believe surgery may potentially be redundant – at least for these two subtypes of breast cancer – because of such a high chance for no evidence of disease at the time of pathological review. If there’s no cancer left after the patient has received chemotherapy and the patient is going to receive local radiation therapy, is surgery actually needed? The challenge has been that standard breast imaging methods cannot accurately predict residual disease after NST. However, by doing the same image-guided percutaneous needle biopsies after neoadjuvant systemic therapy that we do at time of diagnosis, our preliminary research reveals that we may be able to accurately predict which women will have cancer or not. MedicalResearch.com: Could you tell us about the study and the main findings, why is this such an important work? Response: Should the findings be replicated in future studies, this research is the first indication that as the field moves toward more selective, personalized treatment, surgery may altogether be eliminated for a large group of patients. In this pilot study at The University of Texas MD Anderson Cancer Center, image-guided biopsies were able to identify select breast cancer patients where no residual cancer remained. The prospective single-center study has so far enrolled 34 women with early-stage (stage I, II, III) triple negative or HER-2 positive breast cancer. As per standard practice, all patients received neoadjuvant systemic therapy (NST). Prior to standard-surgery, all participants consented to undergo image-guided fine needle aspiration (FNA) biopsy and an ultrasound and/or mammography guided vacuum-assisted core biopsy (VACB). The study measured for accuracy, false negative rate, and negative predictive value were calculated for FNA alone, VACB alone and FNA and VACB in combination. Breast pCR was defined as no residual disease at the time of surgery. Median initial tumor size was 3 centimeters and 47.1 percent had nodal metastasis at the time of diagnosis. After NST, the median residual tumor size was 0.9 cm, with 94.1percent having no palpable abnormality. Following NST, VACB combined with FNA had a 100 percent accuracy, 0 percent FNR, and 100 percent predictive value for determination of residual disease. Grade 1 biopsy-associated expected adverse events, including bleeding, hematoma and bruising, occurred in 6 patients (17.6 percent). MedicalResearch.com: What are the next steps in the field? Response: With this knowledge, there’s an obligation to test whether no surgery, or ‘ultimate breast conserving therapy,’ is safe. There are many single-center and multicenter cooperative groups around the world who are working on similar studies to evaluate the ability to safely identify patients where residual cancer is unlikely. Key to the success in these trials is the need for meticulous breast imaging and working with radiologists carefully to ensure that residual imaging abnormalities are sampled well in order to get accurate results. The accuracy of the preliminary findings led MD Anderson’s Institutional Review Board (IRB) to approve a Phase II clinical trial, which is soon to open at MD Anderson and then across the MD Anderson Cancer Network. The study will enroll women with Stage I and II HER2-positive and triple negative breast cancer. Participants who achieve image-guided, biopsy-proved pCR after NST will undergo whole-breast radiation, without surgery. The trial will be the first using image-guided biopsies in this setting and not include surgery. There is an urgency to test whether surgery is needed. In my conversations with my patients, many express concerns about overtreatment. They want the most personalized care with as minimal treatment as possible. If these findings prove to be true, it would be groundbreaking for patients – both physically and psychologically. 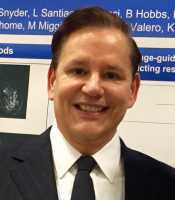 Where can we learn more about the no-surgery trial for exceptional responders at MD Anderson? Image-guided biopsies identified select breast cancer patients who achieved pathologic complete response after chemotherapy and/or targeted therapy, neoadjuvant systemic therapy. This entry was posted in Author Interviews, Breast Cancer, Chemotherapy, Mammograms, MD Anderson, Surgical Research and tagged breast cancer, imaging, surgery by Marie Benz MD FAAD. Bookmark the permalink.